BIRMINGHAM, Alabama – The 2018 NCAA Division III Indoor Track & Field Championships were equally as dramatic as they were historic. Mount Union’s men needed a victory in the final event – the 4×400 – to win its first team title in program history. Wadeline Jonathas became just the second woman in NCAA DIII history – and third person in NCAA history overall, regardless of division – to capture four individual event titles and led UMass Boston to its first national title since 1987. Jonathas turned in quite the performance inside the Birmingham CrossPlex. The sophomore from Haiti won the long jump on Friday and then made quick work of the sprints the following afternoon. Jonathas set NCAA DIII records in the 60 and 200, meet records in the 60, 200 and 400 and posted an all-time top-10 mark in the long jump. The Beacons got 40 of their 46 points from Jonathas alone, which was enough to top runner-up Williams by three. 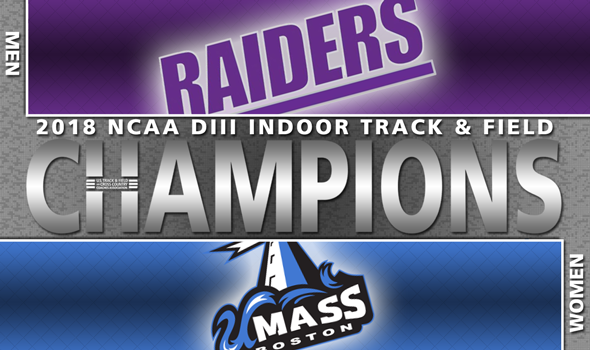 Taylor Driggers added six points to UMass Boston’s total with a third-place effort in the long jump. Ohio Northern finished third in the team standings with 30 points. Emily Richards accounted for 26 of those points with victories in the 800 and mile as well as a third-place finish in the 3000. Richards is the first woman in NCAA DIII history to complete the 800-mile double in back-to-back years. There was a logjam at fourth place as three teams scored 27 points: Nebraska Wesleyan, UW-Eau Claire and Washington (Mo.). Mount Union relied on a balanced effort to win the team title. The Purple Raiders brought home one individual title (Mason Plant in the 60 hurdles), one relay title (the aforementioned 4×400) and posted runner-up finishes in the 60 (Louis Berry) and pole vault (Matt Keim). Sean Sherman added a fourth-place finish in the shot put. Mount Union had to sweat out the result in the 4×400 as it established the time to beat of 3:13.77 in the first heat. North Central (Ill.) needed to go under that to win the team title, but came up short in the second heat when it crossed the finish line in 3:14.48. The Purple Raiders ended up with 41 points, compared to the Cardinals’ 40. Rowan and UW-Eau Claire rounded out the men’s podium with 37 points and 29 points, respectively.